Posted on January 17, 2018 by Margo S.
Mass Audubon’s Coastal Waterbird Program protected threatened coastal birds through management and education at 194 sites along 162 miles of the Massachusetts coastline in 2017. 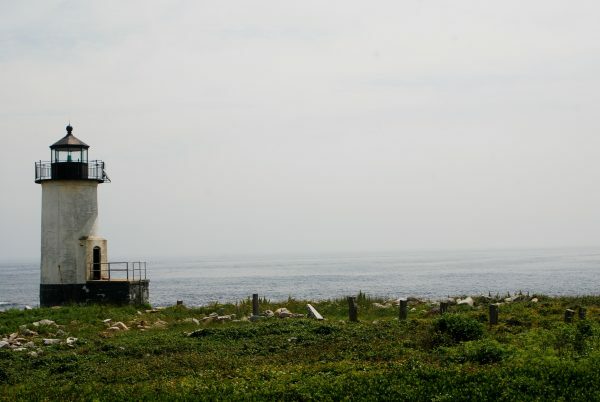 A staff of 56 shorebird monitors and trainees installed protective fencing and signage, monitored nesting activity, provided educational opportunities for beachgoers, and engaged landowners in coastal habitat protection. State abundance of Piping Plover increased to 657 pairs (preliminary data) in 2017 (649 pairs in 2016). Reproductive success throughout the state was poor, and lower than 2016, with a statewide average of approximately 1.0 chicks fledged per nesting pair compared to 1.44 chicks fledged/pair in 2016. The estimate for sustainable reproduction in Piping Plovers is 1.24 fledged chicks/pair per year. 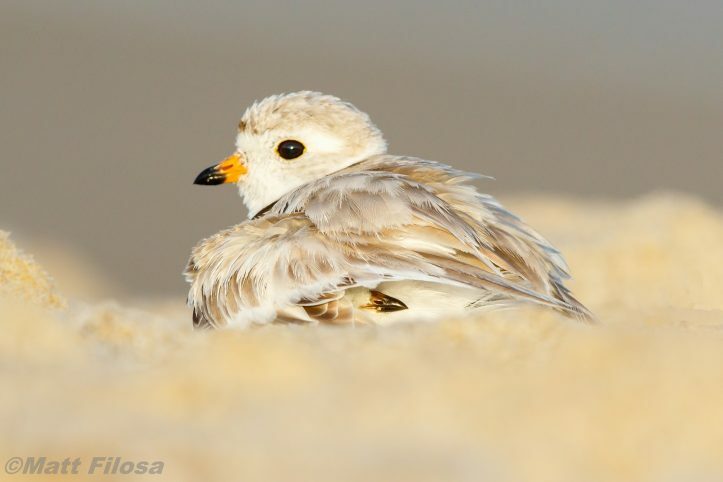 Mass Audubon’s Coastal Waterbird Program protected 216 pairs of Piping Plovers (about 33% of the MA population, and roughly 12% of the Atlantic Coast Population estimated at 1,800 pairs). Predation, both avian and mammalian, limited productivity on Mass Audubon monitored beaches this season (51% of all known egg losses were attributed to predation), making this the greatest known cause of egg loss. Overwash was the second highest cause of known egg loss at 38%. 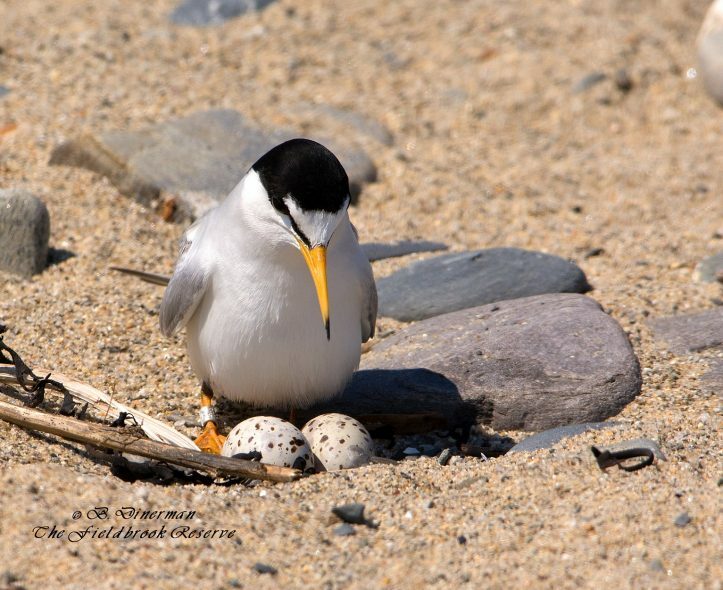 A total of 132 sites were surveyed for tern species; 1,132 pairs of Least Terns (38% of the MA breeding population in 2017) were protected by the Coastal Waterbird Program on 41 sites. 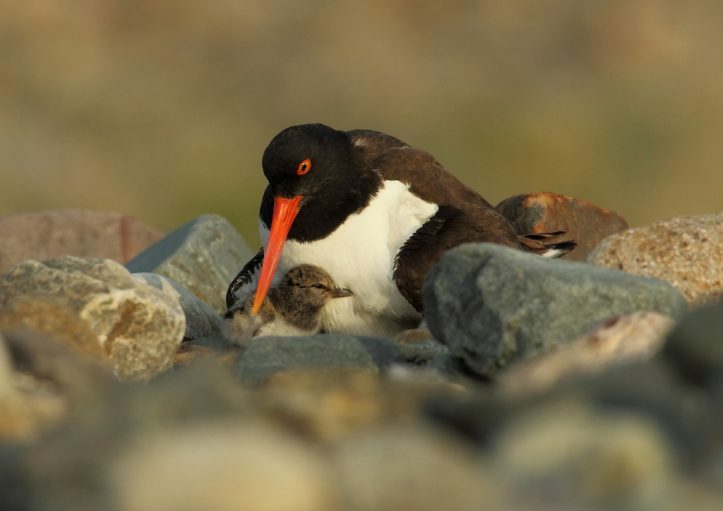 American Oystercatcher abundance in Massachusetts decreased slightly to approximately 186 breeding pairs (approximately 190 in 2016). Forty-five pairs were observed breeding on Mass Audubon protected sites, approximately 24% of the state population, and 47% of nesting attempts were successful in hatching eggs. The Coastal Waterbird Program continued its work on staging Roseate Terns conducting a prey abundance study at several sites on the outer Cape in late summer. Our work shows the importance of Cape Cod staging sites in the annual cycle of endangered Roseate Terns—especially in providing habitat to newly-fledged birds undergoing their first 5,000 mile migration to South America. This entry was posted in Birds and Birding and tagged coastal birds, coastal waterbird program on January 17, 2018 by Margo S..
Posted on November 22, 2017 by Margo S.
Got turkey on the mind? Wild Turkeys represent one of the most successful conservation comeback stories in Massachusetts. Due to habitat loss and hunting, there were no Wild Turkeys in Massachusetts between 1851 and 1972. In 1972 the state Division of Fisheries and Wildlife worked to reintroduce Wild Turkeys in Massachusetts. The 37 turkeys that were released in 1972 started the resurgence of the population that now numbers more than 20,000. Have a wonderful Thanksgiving holiday with your friends and family! This entry was posted in Birds and Birding on November 22, 2017 by Margo S..
Posted on November 16, 2017 by Margo S.
We are proud to share a final report on what The Bobolink Project accomplished during the summer of 2017. But before we share the results, we first and foremost thank our donors. With their financial support, conservation interest, and promotional efforts, The Bobolink Project would not exist. 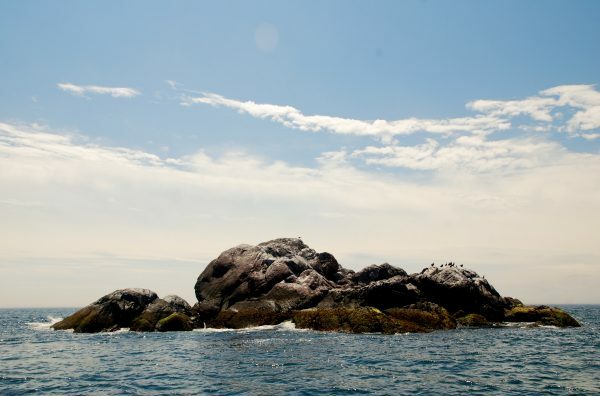 This is very much a grassroots conservation effort—pun intended—and we are deeply appreciative of our donors’ support. We also thank the farmers who applied to and participated in the project. Without them the habitat for grassland birds would not exist. We are glad that they are conscious of the birds on their fields and that they are willing to participate in a solution that allows them to grow a “crop” of grassland birds without compromising their financial stability. In the months leading up to the 2017 field season, we raised just over $38,000 to support the project’s objectives, and 99% of this donation pool was given directly to the participating farmers. Based on the fixed-price reverse auction, the final bid that was accepted from the farmers was $60/acre. With this financial support we were able to enroll about 630 acres distributed among 17 farms—13 located in Vermont, two in Massachusetts, one in New Hampshire, and one in New York. The project state coordinators surveyed the fields this summer to measure the success of the program for grassland birds. They estimated that there were about 294 pairs of Bobolinks on the enrolled fields. Using what we think is a conservative estimate of 2.79 fledglings per breeding pair, we estimate that 820 Bobolink young were produced as a result of the project’s 2017 efforts. The number of fledglings nearly doubled from 2016 to 2017 even though the amount of protected acreage increased by about 20%. The huge increase in fledgling numbers is due in large part to one of the participating farms in particular, which consisted of 146 acres with many nesting Bobolinks. The 2017 breeding season was also especially wet in many parts of the northeast. Increased amounts of rain typically means more invertebrates (e.g., insects) for Bobolinks to eat. This enhancement of breeding conditions could have influenced the higher number of Bobolink pairs and fledglings estimated this year. Another important aspect of this project concerns what we were unable to accomplish. In 2017, we had to reject applications from 19 farmers who had submitted bids that exceeded what we were able to support from our donation pool. In other words, about 615 acres of offered habitat was lost because we needed more donations. Of course, it’s wonderful that we succeeded in protecting 634 acres of grassland bird habitat! But the fact that we had to “leave on the table” a total of 615 acres—land that otherwise might have been protected—is a sobering thought. Remember, the more donations we collect, the more land we can protect from haying. We hope this reminder motivates new and previous donors alike to support the Bobolink Project in 2018. In fact, contributions toward next year’s efforts can be made now—even while the birds themselves are busily heading toward South America! It’s never too early to make a donation, and your gift will be set aside for the 2018 nesting season. To get the latest information follow us on Facebook, check out the website, or subscribe to our e-newsletter. This entry was posted in Grassland Birds, Research and Monitoring, Working Landscapes on November 16, 2017 by Margo S..
Posted on September 12, 2017 by Margo S.
It is with great pleasure that we announce that our third edition of State of the Birds is now available. State of the Birds: Massachusetts Birds and Our Changing Climate focuses on what the future may hold for the breeding birds of Massachusetts as the climate continues to change. Our last two State of the Birds reports, released in 2011 and 2013, compared the past to the present and identified changes in Massachusetts bird populations. The 2017 edition builds on that work by using science to predict the future. Most birds have limited distributions and, to some extent, climate controls the range of those distributions. To glimpse the future, we used a statistical analysis called climate envelope modelling. Put simply, climate envelope modelling uses real bird and climate (various measures of temperature and precipitation) data to define the preferred climate of a bird species—their “climate envelope”—as it is today. Then the models substitute predicted values of the climate variables into the equation to project a bird’s climate envelope in 2050. Using the results of our analysis, we assigned each of the 143 species analyzed a “Climate Vulnerability” score. There were some expected results and some surprising results. The overarching message was that birds are already feeling the effects of climate change and even some of our most common birds will probably experience further changes by 2050. While climate change can feel like an overwhelming problem, it is a problem that we can solve. Much like Scrooge in A Christmas Carol, we are being shown a possible future for our birds, and, just like Scrooge, we can take action today to change that future. Visit the website, download the report, and share it with your friends and family. If we work together we can protect birds, wildlife, and ourselves. 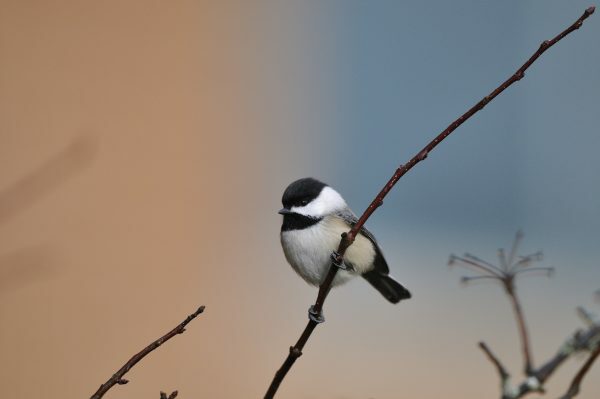 Check out the article in the Boston Globe about the State of the Birds report. This entry was posted in Birds and Birding, Research and Monitoring, Resources and tagged birding, birds, climate change, state of the birds on September 12, 2017 by Margo S..
Posted on May 17, 2017 by Margo S.
On Tuesday, May 9th, I was in Washington D.C. at Standing Together for Migratory Birds—a legislative briefing on federal migratory bird conservation programs. With recent political changes in Washington, it may seem that support for these programs, and the crucial funding they provide, is on the chopping block. But that’s not necessarily the case, and here’s why. As conservation biologists, we understand that humans are inextricable from natural world, and that healthy and functioning ecosystems are inherently good for us. However, we also understand that money talks, and this was a theme of the legislative briefing. In remarks given by Senator Whitehouse (Dem-RI), he stated that, more often than not, humans come first on Capitol Hill, and every last issue gets monetized. With that in mind, the American Birding Association presented on the economics of migratory birds and wildlife watching. For example, the U.S. Fish and Wildlife Service reports that in 2011 Americans spent about $15 billion on birdwatching trips and an additional $26 billion in related gear. A presentation by Ducks Unlimited also showed that significant money is spent hunting waterfowl, and 98 cents of every dollar from federal duck stamps sales goes to the acquisition of habitat—more than 6 million acres since its inception in 1934. Of course, these activities depend on the conservation of our migratory bird species, and that’s where federal programs come in. For example, since 2002 the Neotropical Migratory Bird Conservation Act has provided about $60 million to fund over 500 migratory bird conservation projects. Also, the Farm Bill funds conservation programs that successfully help agricultural producers and migratory birds. For example, thanks to these programs, Whooping Cranes are now nesting in Louisiana farmland – the first state nest in 75 years. However, it’s not just a federal handout. Many programs require additional contributions—as much as 3 dollars for every 1 federal dollar provided. This way programs stimulate conservation activity and non-federal support from sources such as private foundations and donors. With such a sound economics, federal migratory bird conservation programs can receive support from both sides of the political aisle. That said, they are periodically reviewed, and it is important to tell your senators and congressional representative that you support full funding of bird conservation programs. This entry was posted in Events and tagged birding, birds and politics, migratory birds, policy, wildlife and people on May 17, 2017 by Margo S..
Posted on May 16, 2017 by Margo S.
Mass Audubon’s Old Baldy Wildlife Sanctuary in Otis offers visitors with a rare view in south Berkshire County: a near 360-degree panoramic view from the summit of its eponymous hill. The landscape below is nearly entirely forested, with few interruptions. The clearing at the summit itself was expanded around 2000, when a previous landowner sought to subdivide the property, and at the same time the forest growing on Old Baldy’s sides was heavily logged. The resulting overlook is a gem in the Berkshires. 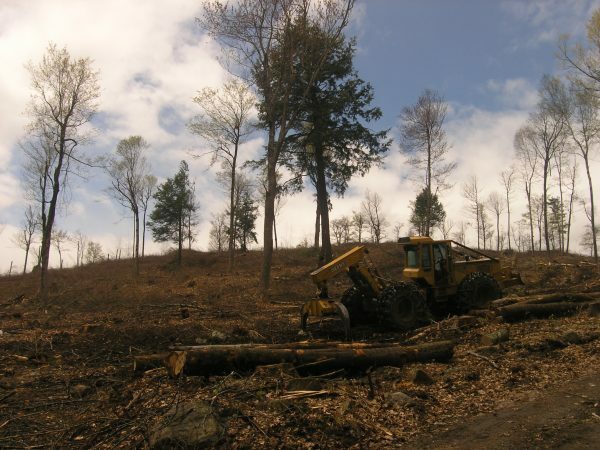 The forest harvesting, while completed for economic return, resulted in a conservation benefit because it created much needed habitat for young-forest associated wildlife species—many of whom are experiencing steep long-term population declines throughout the region due largely to habitat loss. 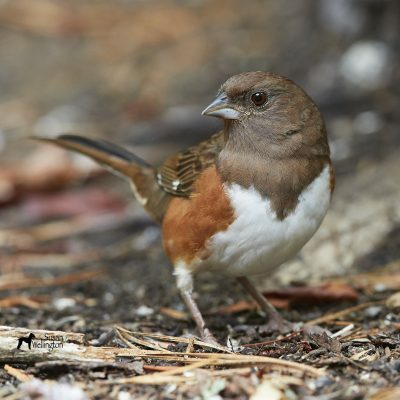 In the years following the harvest young-forest species like Chestnut-sided Warbler, Indigo Bunting, White-throated Sparrow, and Eastern Towhee, thrived in the thicket. However, in recent years the canopy has been closing as the trees grow, and this crucial habitat has been disappearing. With the successional clock ticking, Mass Audubon sought and was awarded a Habitat Management Grant from the state Division of Fisheries & Wildlife, which funded the maintenance and expansion of the clearing at Old Baldy in the early spring of 2017. The loggers did their work well, though the transition appears shocking, with stumps and downed tops strewn as after a storm, and the remnant trees seeming thin and lonely over the slash. Importantly, however, increased sunlight on the ground will stimulate a flush of sprouting, and within a growing season or two the cleared area should be lush with brambles and tree sprouts, again forming the dense cover favored by many species of conservation concern. Within a few years the site will again be prime habitat supporting populations of young-forest birds. Many other wildlife species, including white-tailed deer and black bear, will also find food and shelter in the cleared area. Until the dense regrowth sprouts up, visitors may notice large brush piles scattered throughout the site. These brush piles are supplemental habitat for New England cottontail, our native rabbit species that is of critical conservation concern. Mass Audubon’s decision to maintain and expand a forest clearing at Old Baldy was not made lightly, but was made in recognition that without concerted effort, populations of dozens of wildlife species reliant on young-forest habitat will continue to dwindle in the state. Just as the views from the summit of Old Baldy were beginning to be obscured by maturing trees, habitat quality for young-forest species was also declining, and active intervention was necessary to secure the area’s value for these species. It was time for Old Baldy to get a haircut. And like a haircut, the trees at Old Baldy will grow back, without substantially affecting the land underneath. This entry was posted in Habitat Management and tagged conservation, forest birds, New England Cottontail, Old Baldy on May 16, 2017 by Margo S..
Posted on May 10, 2017 by Margo S.
The Bobolinks are arriving in New England and we’re finalizing the contracts with our participating Bobolink Project farmers. 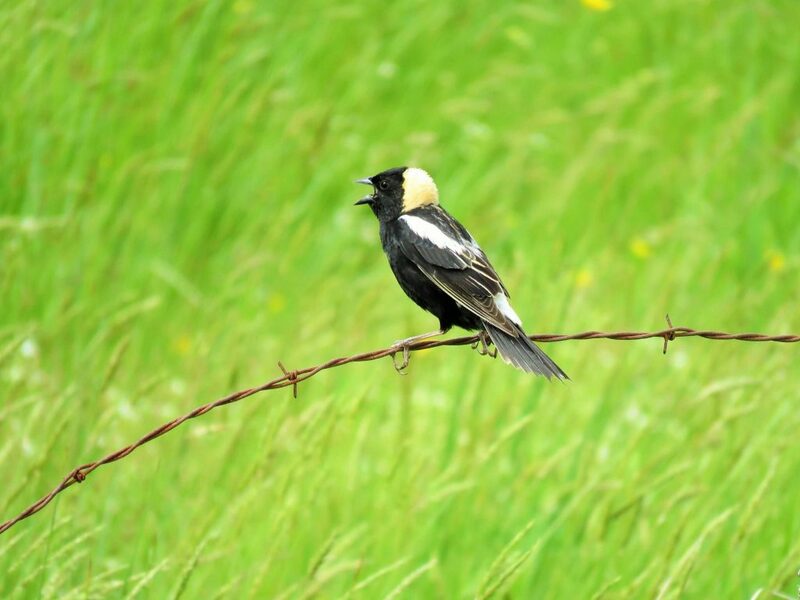 Thanks to the generosity of our Bobolink Project donors, we can protect over 630 acres of farmland this year! 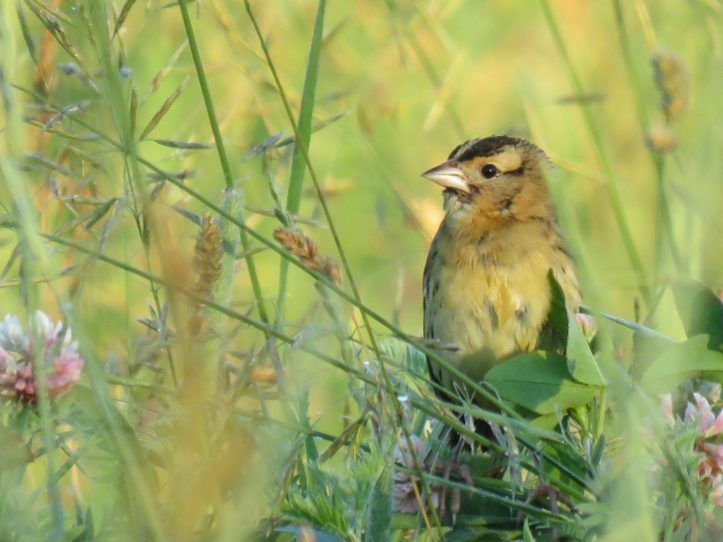 In return for some compensation, the Bobolink Project farmers will delay mowing on their hay fields until the young grassland birds have had time to fledge. As in past years, we had more acres submitted into the project than we could cover with the available pool of donations. This year, we received 40 applications from farmers in Vermont, Massachusetts, New Hampshire, Maine, and New York—but our donation pool, as of April 1st (our deadline for donations), could cover only 17 of the farmers’ fields. This may sound disappointing, but we are able to cover 20% more acres this year at a lower per acre price of $60 (vs. $75 last year). We are glad that the project is continuing to grow and look forward to welcoming grassland birds to fields enrolled in the program this summer and sharing our results with you. Keep up to date with The Bobolink Project by signing up to the mail-list or follow us on Facebook. 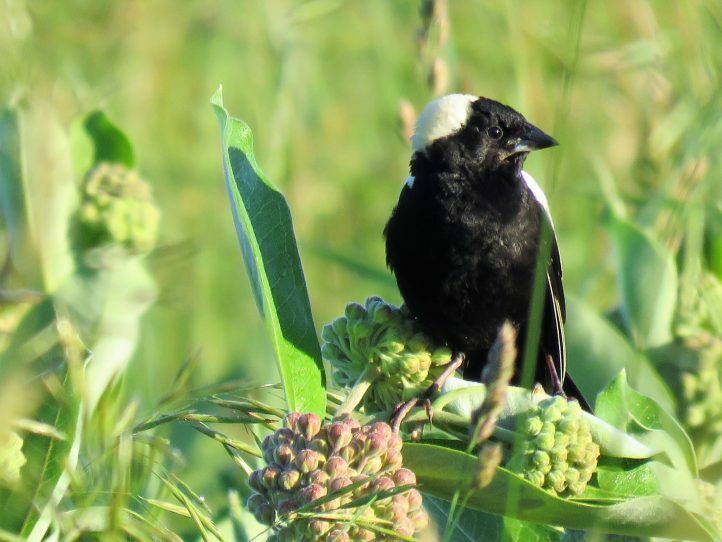 The Bobolink Project donations are accepted all year. The 2018 donation pool is already growing: since April 1st we have received over $8,000 in donations that will be saved for next year. Donate now to help us protect more acres and birds next year. This entry was posted in Birds and Birding, Grassland Birds, Research and Monitoring, Working Landscapes and tagged birds, conservation, grassland birds, The Bobolink Project on May 10, 2017 by Margo S..
Posted on April 19, 2017 by Margo S.
Calling all birders and bird enthusiasts! We have launched a multi-year citizen science project to study Eastern Meadowlarks. The project aims to collect presence-absence data for Eastern Meadowlarks at randomly selected sites throughout Massachusetts from May 15 to June 15, 2017. Eastern Meadowlarks are in serious decline, both in Massachusetts and elsewhere in North America, and in order to better help this species we need to know more about their status in Massachusetts. The data collected through this project will provide valuable information about this species’ current distribution in the Commonwealth, and will form the basis for a better assessment of meadowlark habitat requirements and future conservation needs. To get the information we need it is critical that we get help from citizen scientists. There are a lot of potential sites where Eastern Meadowlarks could be nesting, but there are only a few of us! The results of this work will help us develop models for use in evaluating potential sites that have not been visited. Project data can be easily entered through the Anecdata website on a computer or in the field on a mobile smartphone device. The surveys required are simple and quick (10 minutes!) to do. 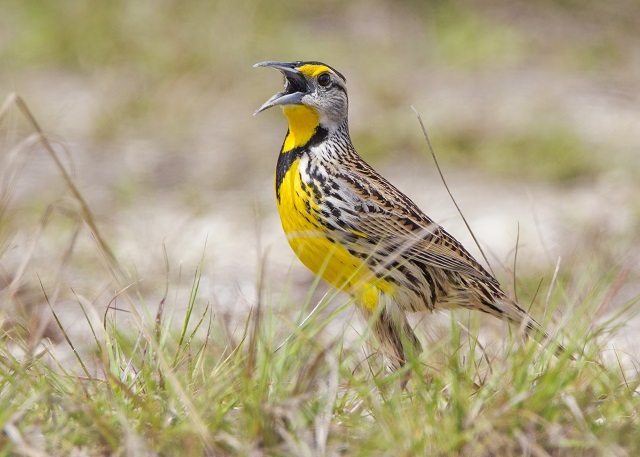 We’ve provided our citizen scientist volunteers with “hotspots” where we specifically need a volunteer to do a meadowlark survey on three separate dates (with preferably at least 3 days in between each date) during the period of May 15 and June 15. Many of these hotspots will likely not have Eastern Meadowlarks, but knowing where Eastern Meadowlarks are not is just as valuable for scientific analysis as knowing where Eastern Meadowlarks are. More information about how to get involved is available on the project website. Not familiar with Eastern Meadowlarks? Check out our quick guide and listen to their song. Questions? Contact us at birdconservation@massaudubon.org. This entry was posted in Birds and Birding, Citizen Science, Research and Monitoring and tagged birds, grassland birds, survey on April 19, 2017 by Margo S..